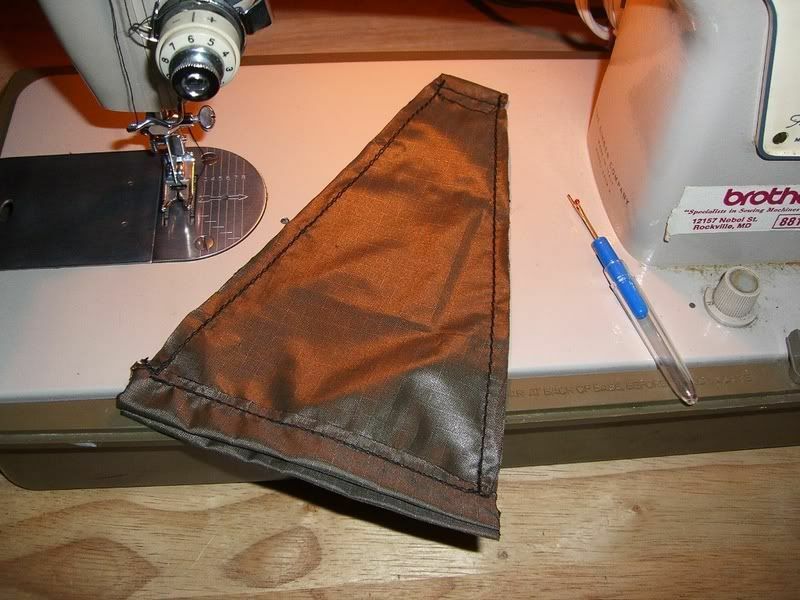 The only thing I didn't like about transitioning from commercial hammocks to making my own were the hammock ends. All that extra material and exposed knots goes against my smooth nature, so I made some covers. 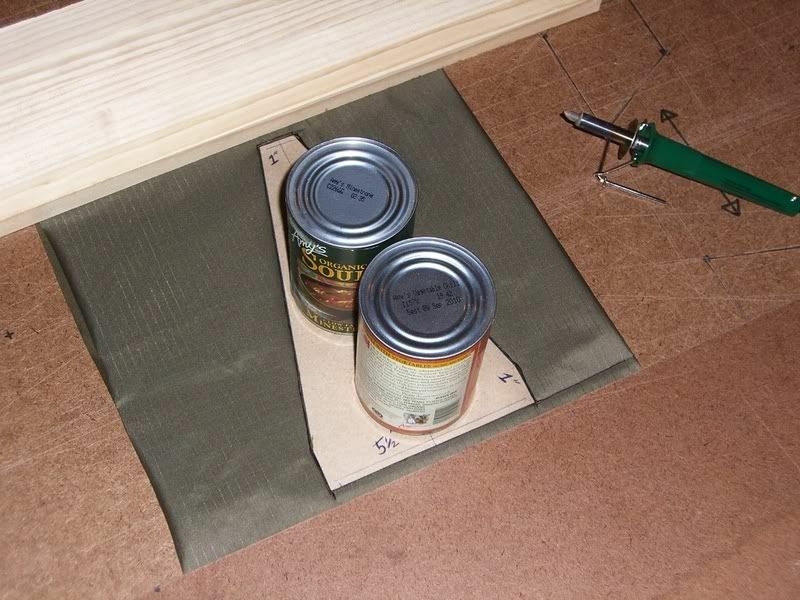 This is a really easy little project, so I thought I'd post the directions. 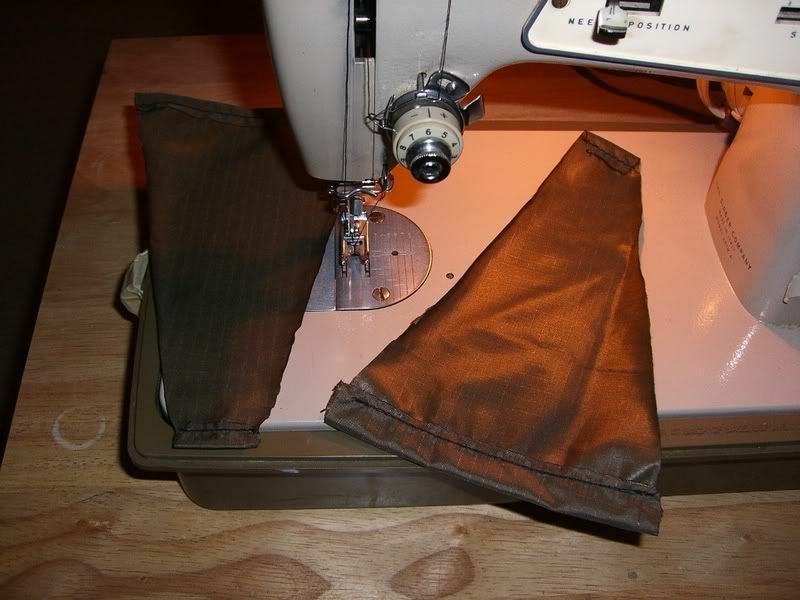 Even a slow seamster like me can make a pair of these in under an hour. You'll need a piece of material about 1' x 2' (less if you're creative with your pattern placement) and a couple of feet of thin shockcord or elastic. These just use scrap of the same material as the hammock body (in my case Ed's chocolate 1.9), but you could certainly use anything you like. Black would make a nice contrast and everyone loves camo. You could also use sil-nylon and make them bigger for some added protection from spray. The ends close off with shockcord. The drawcord channel on this is very rough and in two sections. 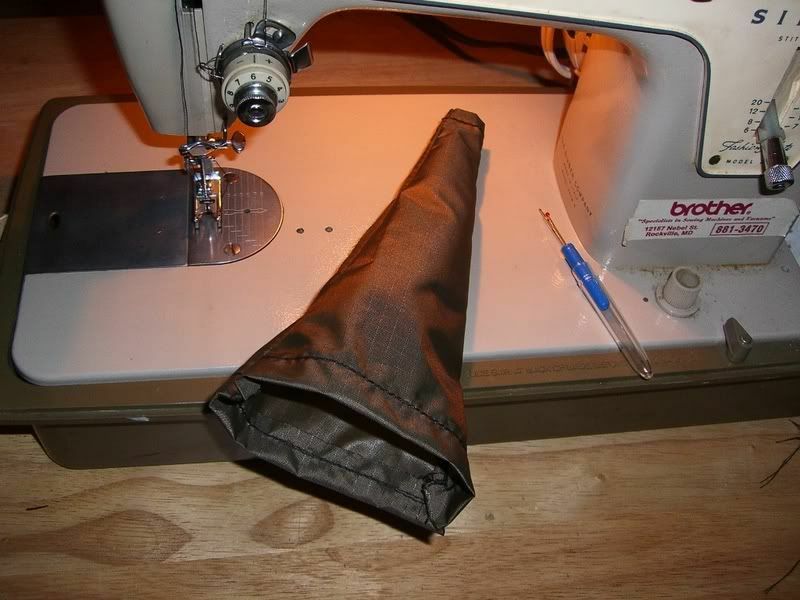 If you wanted to be slicker, you could finish the bottom with a proper drawcord channel the same as you'd do on a stuff-sack. The end result doesn't really wind up showing, so I opted for the quick and dirty route. I also just tie off the shockcord. I thought about using a cord-lock or hook-and-loop, but figured that would be adding more stuff to an area I'm trying to smooth out. I've seen people use zip-ties here, but I like to be able to get in and out of these easily. I had to swap support ropes on a trip the other day and it's nice to be able to roll these on and off. 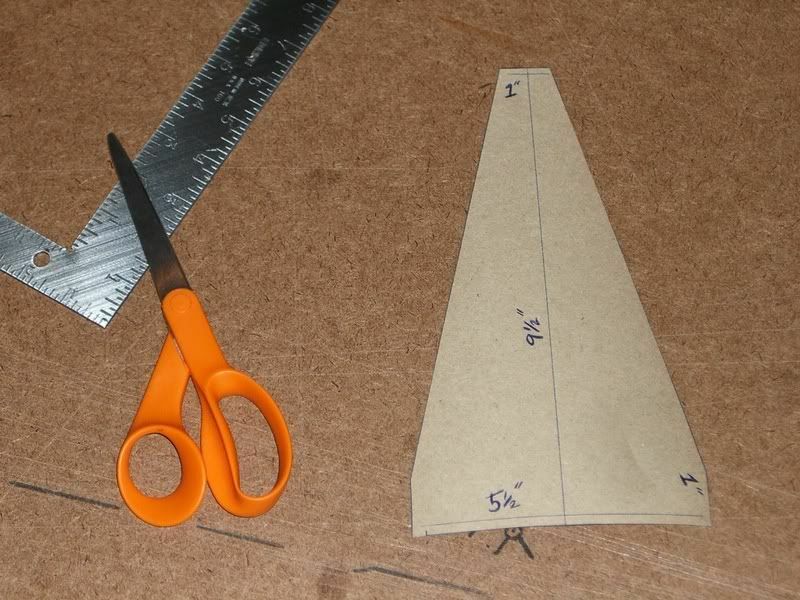 I made a plan out of some cardboard for the first time. I figured friends might want a pair of these and they're easy enough that I'd actually do it. The measurements for the top and bottom edge are for the whole edge, not just half of it. So, the top is one inch wide and the bottom is five and a half inches wide. 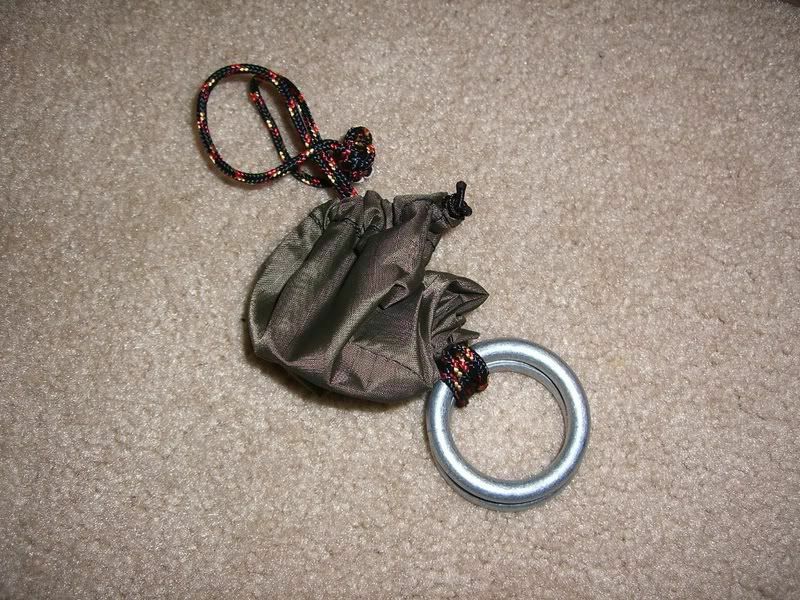 These are sized generously and should work just fine even if you use bulky ropes and whip far from the ends. 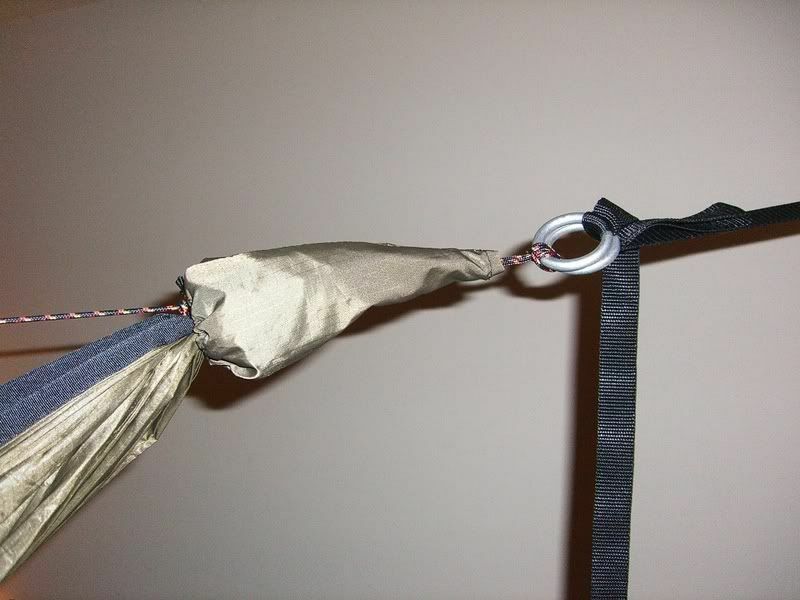 One change you might want to make if you tie webbing directly to the hammock body would be to increase the top width slightly so that the finished piece will be the same width as your webbing. I've been using a hot knife lately. This one's about fifteen bucks from A.C. Moore. They sell it as a woodburning tool and you can buy a bunch of different tips for it. The only drawback is how pissed I get that I made so much stuff without one. It's especially nice when cutting pieces that need to be exactly the same size. Here, I'm cutting all four pieces at once. They fuse together some and the edges will fray a little bit when you peel them apart. You'll still need to touch up the edges here and there with a flame, but it's still much, much nicer than cutting them the old-fashioned way. Amy's soups and chili are delicious. Hem the top and bottom. The bottom is going to be your shockcord channel, so be sure to leave enough room. Each side will have its own channel and we won't bother connecting them, but it won't show in the end. I still pin everything. Here are the two pieces pinned together inside out. If your pieces came out very different in size, I would line up the tops and let the bottoms overlap a little. You won't really see the bottoms when everything is assembled on your hammock. Stitch the sides. 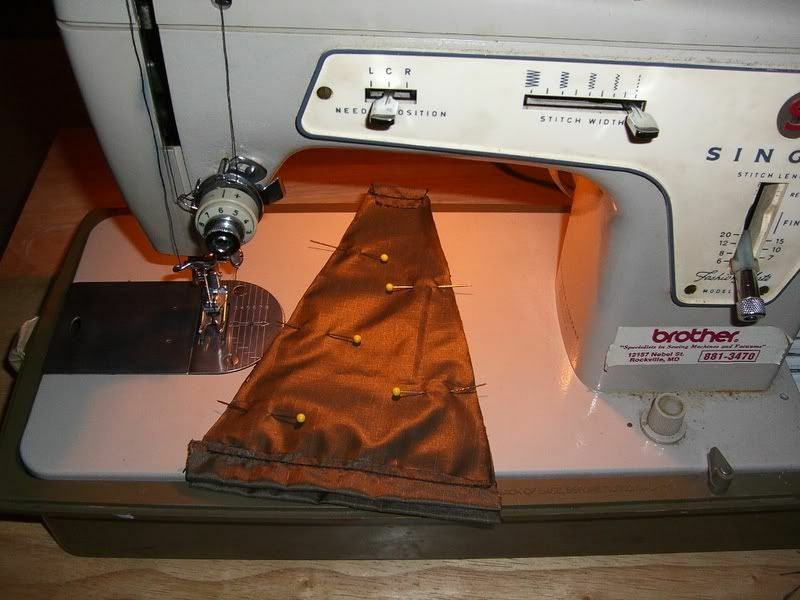 Be sure not to stitch the ends or the openings at the drawcord channels. I went down and up on both sides. Turn everything inside out and you're almost done. Run some thin shockcord through both channels and tie it off. I size the opening a bit bigger than my thumb when the shockcord is slack. 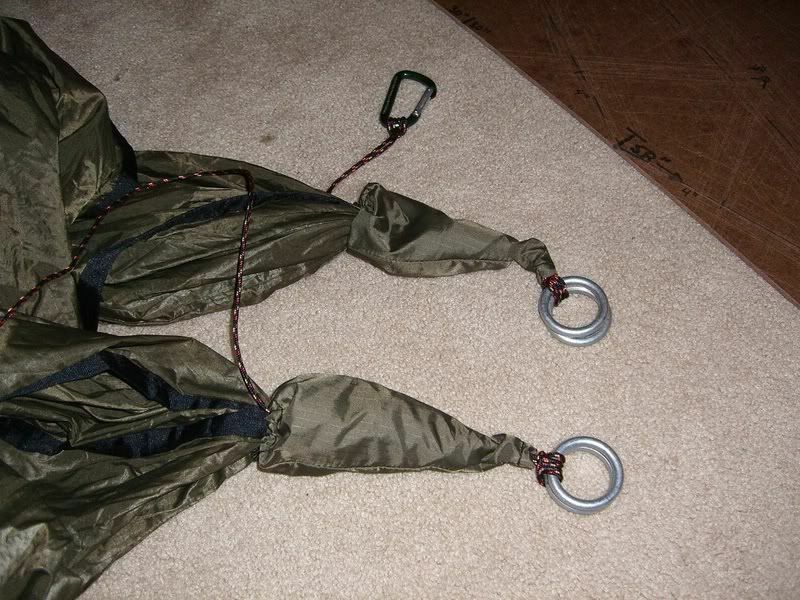 You want to be able to slip this over your hammock end without too much trouble, but still be snug when it's on the hammock. If you're not sure, try it on the hammock a bit before clipping the ends off. I made these the same night that I made my first set of ring buckles. After finishing the covers, I thought I'd really screwed myself because I didn't think I could lark's head the buckles in place. I always lark's head by actually going around the hammock body and back through the loop. Fortunately, I realized that grown-ups can make the lark's head loop first and then slip it over the hammock end, so all was well. 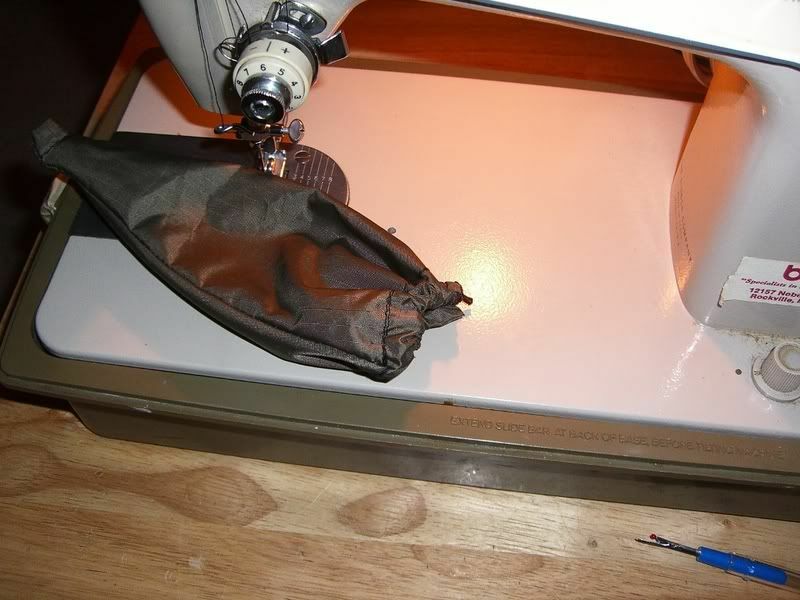 Feed the cord through the small end of the cover, pull it through, then make your lark's head and you're all set. Here's everything attached, but not rolled down yet. What an unsightly tangle. Here's one finished. 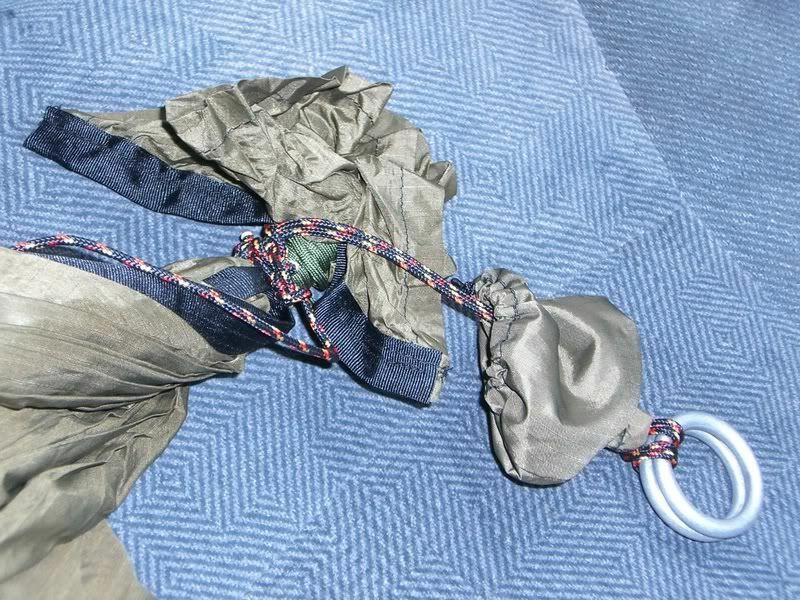 You might have to poke in a stray cord or bit of fabric, but this part should be pretty easy. If you're really having to jam everything in, your shockcord is probably too tight. The biner in the picture is for my ridgeline. 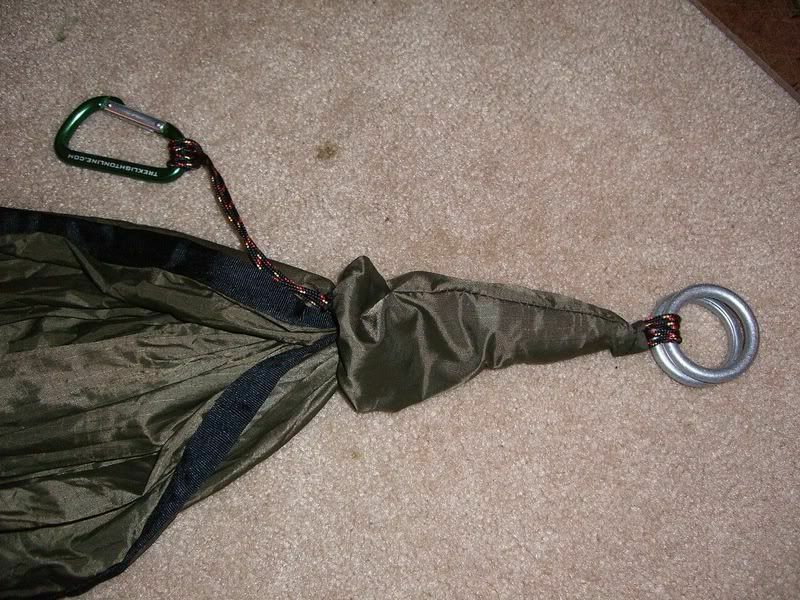 I like it detachable so that I can have it out of the way when the hammock is set up like a chair. The black is grosgrain I finish the hammock edges with. Like I said: smooth. Here's the finished pair. Pretty snazzy. And here it is when set up. Another perk of the not-super-tight shockcord is that it's easy to roll back and forth if you need to make adjustments to anything underneath. Here, I'd set up with my new buckles and a new ridgeline for the first time, so needed to play with things a bit to get them just right. The covers slipped on and off with no trouble.